Fredrik Larsson is the YouTube star par excellence that Sweden has produced. 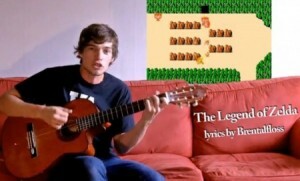 He became popular when he recorded and uploaded a TV theme song medley way back in March, under the name “FreddeGedde”. And now he is back with more, only that this time he is singing themes from cartoons. Duck Tales, Teenage Mutant Ninja Turtles, Animaniacs, Inspector Gadget, Ghostbusters, Digimon, Darkwing Duck… that is just the beginning of this new medley. Lasting seven minutes, it is sure to bring quite a good couple of infant memories back. Personal favorites? The Smurfs, Bravestarr and The Gummi Bears. And the Donald Duck impersonation at the end is radical. Previous post: The “Michael Jackson – The Experience” Game Is Coming Complete With… A Free Studded Glove!